Explanation: Over 150 light-years across, this cosmic maelstrom of gas and dust is not too far away. It lies south of the Tarantula Nebula in our satellite galaxy the Large Magellanic Cloud a mere 180,000 light-years distant. 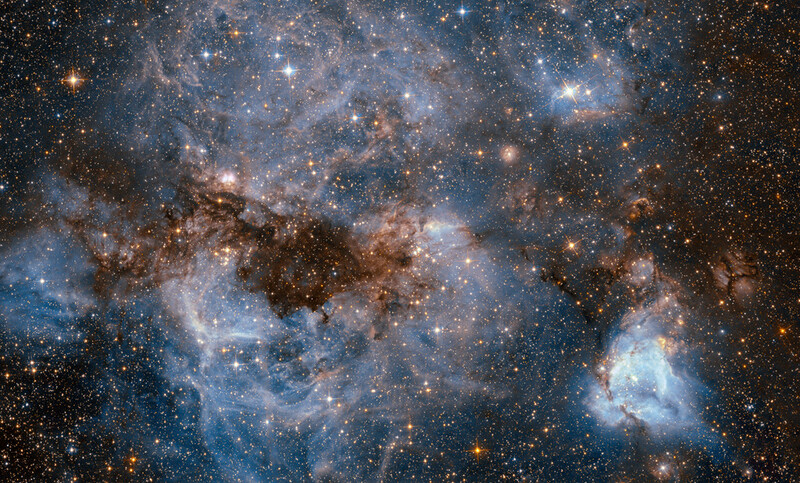 Massive stars have formed within. Their energetic radiation and powerful stellar winds sculpt the gas and dust and power the glow of this HII region, entered into the Henize catalog of emission stars and nebulae in the Magellanic Clouds as N159. The bright, compact, butterfly-shaped nebula above and left of centre likely contains massive stars in a very early stage of formation. Resolved for the first time in Hubble images, the compact blob of ionized gas has come to be known as the Papillon Nebula.